Flying Storks has the cutest storks in all of Maryland & Northern Virginia. For about the cost of sending Flowers, call and order your Personalized Stork Sign Yard Card Birth Announcement Today! $99-$125 includes, delivery, pick up, and all Stork Bundle Keepsake customization. 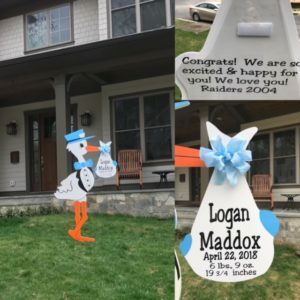 Please contact us at (301) 606-3091 to rent a stork sign to welcome home your new baby or grandchild. Call us at (301) 606-3091 for more information or to book your stork rental today! Please visit us on FB to see our most current rentals. Please follow us on Pinterest . We’re also on Google Plus too!